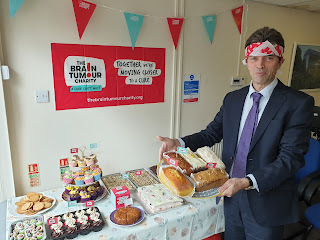 Carshalton & Wallington MP Tom Brake has hosted a bake sale and raised £350 for brain tumour research. The money raised at the event will be donated to The Brain Tumour Charity, a charity that aims to find a cure to brain cancer and double the survival rate by 2025. Every day, 31 people in the UK are diagnosed with a brain tumour. Survival rates are just 14% and have barely improved in the last 40 years compared with other cancers. Investment in research is extremely low and diagnosis is taking far too long. The Brain Tumour Charity strives to change this.